The Digital Research Library of Illinois History Journal™: The History of Kwa̱nu’sila, “The Thunder-Maker.” The Totem Pole from Chicago's 1893 World's Fair then moved to Addison and Lake Shore Drive. The History of Kwa̱nu’sila, “The Thunder-Maker.” The Totem Pole from Chicago's 1893 World's Fair then moved to Addison and Lake Shore Drive. This information was provided to me directly by Wax̱a̱widi Chief William Wasden Jr., the great-great-grandson of the original carver of Kwa̱nu’sila. It was in Chicago's 1893 World's Columbian Exposition then stood at Addison and Lake Shore Drive in the Lincoln Park community. The Totem Pole that currently stands in the Lake View community at Addison Street just east of Lake Shore Drive (3510 North Recreation Drive) in Chicago, Illinois was installed in 1986. The Lincoln Park totem pole belongs to the tradition of the Kwakwa̱ka̱’wakw Indians in western British Columbia, Canada. The Kwakwa̱ka̱’wakw Indians are renowned for their woodcarving skills, including not only totem poles, but also elaborately carved and painted masks. Totem Pole sculptures belong to the tradition of several Pacific Northwest Native American tribes living in Alaska, western British Columbia and stretching south into the states of Washington and Oregon. These totem poles were placed in specific locations and served three main purposes. Some were placed on the front of a house, often framing the doorway. Other carved poles were found in the interior of the house, acting as supports for the roof beams. And some were free-standing, erected outside a home. Poles were commissioned by chiefs or other wealthy members of the tribe to commemorate an event, memorialize a death or mark a particular location. Many Chicagoans had their first contact with the Totem Pole Kwa̱nu’sila “The Thunder-Maker” during the World's Columbian Exposition of 1893. Lincoln Park totem pole during the 1929 dedication ceremony (left). Totem pole about 1967 (right). Note the differences, particularly in painted design. Franz Boas was working at Harvard’s Peabody Museum and was asked to participate in the 1893 Columbian Exposition. He had already traveled to British Columbia, where he sought out George Hunt. Hunt was the son of a Scottish Hudson Bay Company employee who married a high ranking Tlinglit woman from Alaska. At the time it was practice for employees to marry First Nation women in order to gain access to communities in order to conduct trade. His father’s position was in Ft. Rupert, B.C. where the Kwakiutl’l lived. George Hunt was given full Kwakiut’l status, and spoke both Kwakwa’la, the native language, as well as English. This made him a valuable informant for Boas, and they began collaborating in 1885 on Kwakiut’l ethnography, for which Hunt wrote three-quarters of Boas’ ethnography. Hunt assisted Boas in collecting and in mounting the Columbian Exposition project, bringing Kwakiut’l to Chicago’s Jackson Park to erect a native village. After the Exposition, Boas joined the burgeoning Columbian Museum of Chicago (Later to be renamed the Field Museum of Natural History), and worked there for several years. Boas was asked to leave the museum and he resumed teaching at Columbia University, becoming the “father of American Anthropology.” Boas and Hunt continued working together for decades, refining the ethnography. Boas incorrectly named all the Kwakwaka’wakw First Nation as the Kwakiut’l, given their common language, though the Kwakiut’l were but one of the tribes in that language group and Nation. It should be noted that Hunt also worked with Edward S. Curtis, and was the assistant director on "In the Land of the War Canoes" (formerly called "In the Land of the Headhunters"), produced in 1914. There is no record of George Hunt being involved in the purchase of the Kwanu’sila Totem Pole. After the Exposition, most of the objects from the exhibit were donated to the Columbian Museum of Chicago, where many can still be seen on display today at the Field Museum. The totem pole in Lincoln Park, however, was not from this collection. The original pole that stood at Addison and the lakefront in Lincoln Park was donated to the city in 1929 by James L. Kraft, the founder of Kraft Inc. The pole was 40 feet tall and, like many totem poles, was carved from a single cedar log. Mr. Kraft, an accomplished lapidary and collector of jade, made trips to Alaska and the Pacific Northwest in his search for jade and other rare minerals; while on these trips the unique art and culture of the Northwest Coast Indians attracted him. In 1926, after several years' negotiation, he purchased through intermediaries two totem poles (including the one to be placed in Lincoln Park) and a 15-foot-long feast dish; the three huge carvings were shipped to Chicago from British Columbia on railroad flatcars. In 1927 the feast dish was given to the Wisconsin State Historical Society, in Madison, and in 1952 the Historical Society loaned the dish to the Thomas Burke Memorial Washington State Museum at the University of Washington in Seattle, where it remains on exhibit. One of the totem poles now stands on private property, "Kraftwood Gardens," of the Kraft family in northeastern Wisconsin. The other pole laid on the Chicago River dock of a Kraft plant for three years. Finally, in 1929, James Kraft gave the pole to the City of Chicago. It was erected in Lincoln Park and officially dedicated to the schoolchildren of Chicago in June of that year. But the city was not kind to the sculptural landmark. The victim of carpenter ants, vandals, and the normal processes of weathering and decay, the Lincoln Park pole has undergone more than a dozen modifications since 1929. All of this restoration has been done under the direction of Kraft, since it was arranged at the time of presentation that the company would continue to assume the task of maintenance. In 1958 the arm positions of the pole's human figure were changed because rotting had occurred in the arm sockets; one hand was moved so that it covered the figure's eyes. (A visitor observed that the figure no longer had to watch the spectacle of rush hour traffic which passed before it.) 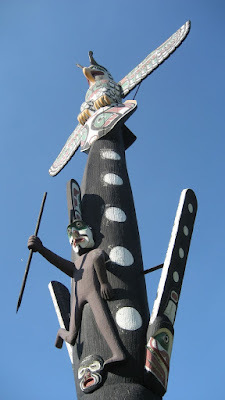 In 1966..the pole was drastically renovated: the sea monster at the base, the Thunderbird at the top, and the human figure were recarved by skilled Kraft workers. Their work appears to be a faithful attempt at restoration, but the painted symbols were inaccurately reproduced. The significance of features in the original painting, which had been more elaborate, could never have been appreciated by a restorer unacquainted with Northwest Coast art. A Kraft supervisor of the restoration has suggested that Kraft workers trying to copy the intricate symbols perhaps didn't realize how important it was to duplicate features with great accuracy. The original painted symbols on the pole have almost totally disappeared. Kraft has tried conscientiously to hold back and to repair the onslaughts of time as well as acts of vandalism against the pole. In 1982 the Field Museum opened its permanent exhibit dedicated to the "Maritime Peoples of the Arctic and Northwest Coast" for the first time. Research conducted for the preparation of the exhibit brought new attention to the lakefront totem pole, and experts began to suspect the pole was of greater historical and cultural importance than anyone had realized. As a result, members of the ‘Namgis and Kwakiut’l tribes of the Kwawkaka’wakw First Nation visited Chicago in 1985. They saw the terrible condition of the pole, and mounted a limited effort to repatriate it in order to preserve it. It had been repainted with house paint and was disintegrating. A deal was struck. The Kwa̱nu’sila totem pole was to be sent to U’mista Cultural Centre in Alert Bay, B.C. for evaluation. After realizing there was nothing to do, Tony Hunt, Jr., a relative of George Hunt and a famous carver was commissioned to replicate it. It is that pole that now stands in Lincoln Park. Kraft Inc., following the example of its founder, then commissioned a new pole to take the place of the original. 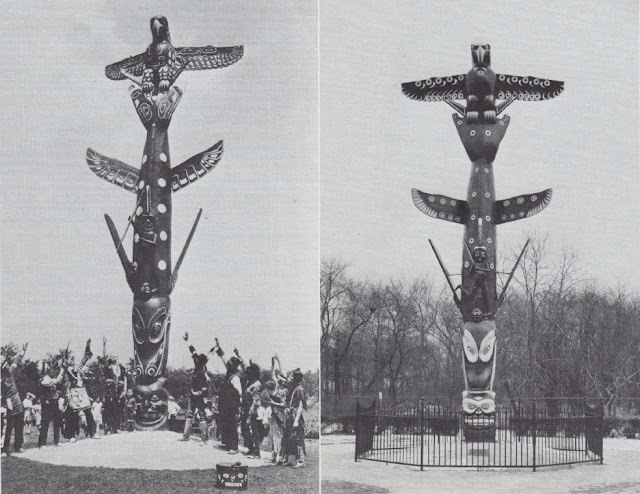 The totem pole which stands today at Addison Street and Lake Shore Drive was unveiled on May 21, 1986, and it is a faithful replica of the 1929 pole that restored the form and colors of that pole as it looked before it was damaged by botched restoration attempts. A sea monster with a lively expression forms the base of the pole, while a whale balances on top of it with its tail in the air. The pole is topped by a thunderbird with its wings outstretched, and which grips the whale's tail. Tony Hunt Sr. carved the current lakefront totem pole, which is called Kwa̱nu’sila. Hunt is the hereditary chief of the Kwakwa̱ka̱’wakw tribe of Fort Rupert, British Columbia. He is also an internationally renowned artist whose work in wood, carved in the Kwakwa̱ka̱’wakw tradition, can be found in collections such as the St. Louis Art Museum, the Fine Arts Museums of San Francisco and Chicago's own Field Museum. Tony Hunt Sr. is also a descendent of the same George Hunt who brought the Kwakwa̱ka̱’wakw to the World's Columbian Exposition in Chicago more than a hundred years ago. So, that he should be the artist responsible for the lakefront totem pole seems both meaningful and appropriate. Kwa̱nu’sila is a special and important work of public sculpture in Chicago. And, although it was completed in 1986, the totem pole by the lake has a story that goes back to the 19th century. This information was provided to me by Wax̱a̱widi Chief William Wasden Jr., great-great-grandson of the original carver of the totem pole Kwa̱nu’sila that Kraft bought. The Totem Pole Kwa̱nu’sila “The Thunder-Maker.” Originally from Alert Bay BC Canada. On the marriage certificate of his granddaughter Emma, his daughter Alice has given her name as Esther Alice “T̓łaxw̱ ’sam”. Waxa̱ ̱widi and Tł̓ axw ’sa̱m are also identified as the same man in a tape-recorded interview with Mrs. Moses Alfred known as Axa̱ ̱wa. The totem pole “Kwa̱nu’sila” stood outside of the house of “T̓łax̱w’sa̱m,” the pole was purchased from him by the Kraft Foundation. The crests on the totem represent the history of the Gigi̱lg̱a̱m “First Ones” clan of the ‘Na̱mg̱is Tribe. There are now four clans and the Gigi̱lg̱a̱m are seated as the second in social order. This clan was founded by a Thunderbird named Kwa̱nu’sila who transformed into a man to start this particular tribe. The Legend of Kwanu’sila and ‘Namugwadzalas told by Mrs. Stephen Cook. ‘Namugwadzalas was the first man of one of the clans of the ‘Namgis Tribe of Indians. He was camped on the Nimpkish River just below the lake at the time of this story. Udzo’las “Flat Place” is the name of the present site of the fishing village of the ‘Namgis. This man became tired of the migratory life he was living, and wanted a permanent home, so in his mind he made a plan of the present type of Indian Community house. To build it, he secured and prepared huge cedar timbers; each shaped and cut with a hand adze. He put in the huge posts and cross pieces, but he had not foreseen that he could not put up alone the huge ridge beams, and so when all was ready he found to his sorrow that he could not lift the big timbers into place. When he realized this he was very sad. He sat out on the bank of the river and could have cried had he not been a brave man. As he sat there feeling so glum, he looked across the river and saw a huge Thunderbird sitting on a large stone. He said to the bird, “If you were only an intelligent human being, what help you could be to me with your great strength.” The Thunderbird said to him, “Why, I am human, what do you wish?” As he spoke, he lifted up the visor of the Thunderbird costume, and showed his face, the face of a man. “I wish you could help me to put up the beams on my house,” said the man. “Surely,” said the Thunderbird, who closed up his visor and flew up and alighted on the middle of the big beam and seized it with his enormous claws, carrying it up and placing it in position on the posts. He then asked the man what his building was to be. ‘Namugwadzalas told him of his idea of building for himself and his people a permanent home. The Thunderbird said it was a grand idea. “I think,” said he, “I will join you and together we will form a tribe.” Then the brave ‘Namugwadzalas told him that he would rejoice in his company. This is the legend of the Thunderbird, telling why its spreading wings adorn all totems of the ‘Na̱mgis Tribe. It is still believed that when there is thunder over the Nimpkish River, one of the Tribe or line of the ‘Na̱mgis is in danger of death, near death, or dead. Story of the Totem Pole belonging to the Gigi̱lg̱a̱m as told by Chief Ha̱mdzida̱g̱a̱me’ Charles Nowell. A man up ‘Na̱mg̱is River named “Gwa’ni” near the lake, he was a steelhead salmon before he became a man. When the Great Flood began, he assumed his steelhead dress again and stood behind a rock at a place called U’dzolas. When the Flood receded he became a man again. His name was X̱wax̱wasa “Easily Excited.” He began to make his house at U’dzolas. He had the posts up, boards, and was making the beams. When he finished it, he sat down wondering how he was going to raise them up. Suddenly a big bird flew down and sat on the rocks at the bank of the river. It was the Thunderbird Kwi̱nkwi̱nxwa̱lige’. X̱wax̱wasa turned around and saw Kwi̱nkwi̱nxwa̱lige’ and said, “I wish you were a man, to help me raise these beams. I don’t know how to raise these beams by myself.” This bird raised his mask and said, “I am a man! I came on purpose to help you.” He put back his headdress and flew up, and came to the middle of the beam, grabbed it with his claws, and flew up, to lift it up on top of the posts. Then he sat on the rocks where he was before. Then X̱wax̱wasa said, “I wish you would stay with me because I am all alone. We’ll build another house below mine.” So Thunderbird says, “I’ll do that.” He took off his bird clothing and said to his clothing, “You go up! But don’t make thunder too often. Whenever there will be death among the people that come after me, make thunder.” This man’s name was Gi̱lg̱a̱m “The First One” and he became the ancestor of the Gigi̱lg̱a̱m ‘na̱mima “clan.” Kwa̱nu’silawe’ are the descendants from the Kwi̱nkwi̱nxwa̱lige’. This is their name when they use the Thunderbird for their crest. Gigi̱lg̱a̱m ‘na̱mima has a totem pole with a Thunderbird on top, a whale below and on the back of the whale is a man holding a spear (he is X̱wax̱wasa, and on the bottom is the head of the ‘Na̱mx̱iyalagiyu the Halibut-Like Sea Monster (this is the creature with a man on its back that went to Xwa̱lkw). 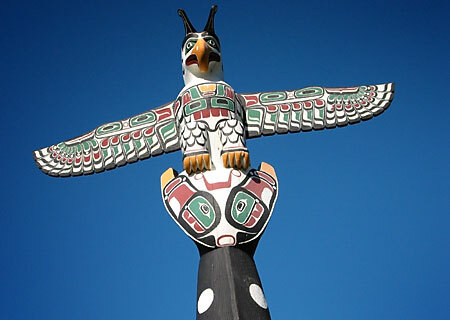 At the top of the pole stands the Thunderbird (the other pole has a Ḵulus, another species of supernatural bird covered in thick white down and a blueish-green beak and only feathered plumes on its head), one of the most ancient of the Indian symbols, a sacred and all-powerful being. According to legend, the mighty Thunderbird has his powerful talons fastened deep in the quivering flesh of a great Baleen Whale, on whose broad back the universe rests. The Steelhead Man, historic tribal founder, is the carved figure standing in relief, with raised lance, against the body of the Whale. This carving tells how the Steelhead Man, transformed from a Steelhead Salmon at the Nimpkish River after the Great Flood, meets with his Creator the Thunderbird who helps him rear his dwelling, set up his tribe, and overcome all human and fabulous sea monsters. The carving just below the Steelhead Man represents the great victory of a warrior’s daughter over the fabulous double-headed monster of the sea, the “Sisiyutł”. The princess-daughter, approached one day on the river bank by this fearsome monster, is given miraculous strength. In her hands is placed a divinely sharpened spear by the ever- protecting Thunderbird. She smites the monster and is honored by her tribe. The warriors of the tribe vie with one another for favor with her. The blowhole of the great Whale is a warrior’s face and references the legend about the princess who slays the double-headed serpent to take the supernatural power of the serpent for her own and becomes a powerful warrior amongst her tribe. The base figure and what represents our grandfathers (ancestors) crest holding up the history and cultural obligations of the family. Amongst Kwakwa̱ka̱’wakw culture the “low man on the totem pole” is the foundation and strength of the family, our paternal ancestry. Quite opposite of the western saying about the low man on the totem pole. The base figure is the head of an important sea monster that has come to be the famous prized crest of the ‘Na̱mg̱is Tribe. Legend of the Tsitsał̱ ’walaga̱ ̱me’ “Famous Ones” 1st Clan of the ‘Namgis. In ancient times, many of our first ancestors came to the world as animals or supernatural beings that transformed into people and began our tribes. After some time, the first people became bad and were very disrespectful to each other and mainly the animals and the land. The Iki Giga̱ ̱me’ “Great Chief Above” was going to send a huge flood that would cleanse the earth and create a new beginning. There were some people who were to be spared from this great catastrophe due to their respect and following of the ancient ways. Some of these people were sent messages through dreams or visions about the flood that was to come. One ancestor of the ‘Na̱mgis Tribe was sent a message from the Creator in a dream that when the flood came, the great Halibut-Like Sea Monster ‘Na̱mx̱iyalagiyu “Only One” would rise from the depths of the ocean to come and take him to a place where he would be protected for the duration of the flood. This man waited on the beach out in front of his village at the mouth of the river when it began to rain and never stopped for a very long time. This man waited and waited until the water had risen to very high levels and was standing in the water that had risen up to his neck. He had almost given up believing that he would be saved and was ready to run and try and seek refuge. Then a great swell came from the sea and the water levels began to drop. Out of the ocean surfaced ‘Na̱mx̱iyalagiyu that swam to the beach and allowed the man to climb on and walk towards its back. This creature was so big that the man appeared to be a small speck on the rim of the monster. The man was bestowed with supernatural power and the ability to breath under water and was then carried to the bottom of the ocean. He was taken there for a great length of time. The flood was said to have lasted a very long time and that the tides were extremely rough around the world. A great number of people perished during this time. When the flood receded, ‘Namx̱iyalagiyu surfaced from the depths of the sea and returned the man to the shore at his home at Xwalkw “Foundation” and then returned to its home under the ocean. During the Great Flood the former people that did not survive, were transformed into animals and stones. The man looked around the land and saw that there were no other survivors; therefore, he called himself ‘Na̱mukustolis “Having Come to the Earth as the Only One”. In time, ‘Namukustolis grew lonely, so he made a snare and caught seagulls that he transformed into people. These people became his tribe and he married one of the women. Soon, he had a son called Nage’ “Mountain.” Together he and his son kept a fire going on the beach and were always sitting beside it. Then one day, Ka̱̓ ’niki’lakw the “Transformer” in his canoe passed their way and landed at Xwa̱lkw. He sat down by them at their fire in such a way that ‘Na̱mukustolis and Nage’ were sitting on one side and him on the opposite. He wanted to test his spiritual power with them, so he put some fish, which, he had with him by the fire and roasted it. Na̱ge’ wished to eat some of this fish, so his father held his hand underneath it and caught the fat dripping down and gave it to his son to taste. Ka ’niki’lakw took the fish and broke it and gave it to them to eat. He thought that they would die because it was really a Sisiyutł “Double-Headed Serpent,” but to his surprise it didn’t harm them. ‘Namukustolis himself had a Sisiyutł, which, he roasted and gave to Ka̱̓ ’niki’lakw to eat in return. Ka̱̓ ̓niki’lakw was very surprised at this. Then Ka̱̓’niki’lakw tried to transform the two into a pair of ducks. He succeeded, but after a short time, they both became human again. They sat down by the fire again and Ka̱̓ niki’lakw then transformed them into two large mountains. Again, the two soon regained their human shape. Then he transformed them into a pair of kingfishers. These too, soon became human again. Love reading your articles. This one on the totem pole is very interesting. I can remember going to see it with my Mom and Dad as a child. One thing I didn't know was that it had suffered fire damage from vandals. Such a shame. Thanks, Neil, for all the work you do to keep us all informed of the history of our beautiful state. Wonderful article & great photos. Thank you! I remember going to Boy Scout PowWow's at the park with the totem. Would have been early to mid 1970's. Great article!